I’ll admit I was a little skeptical about the newest Grinch movie. I was not a fan of the live action version. But I do adore Benedict Cumberbatch so I thought I’ll give it a shot. We walked out of the theater loving it. The Grinch is funny, heartfelt, and all the nods to the original make me one happy girl. 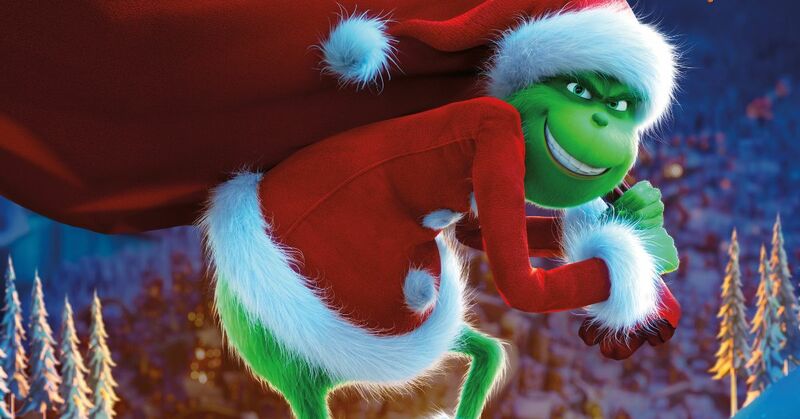 While it might be a fresh take on a classic tale, this Grinch movie retains the overall feel of the first film and that is what makes it one of our new holiday favorites. Whether you are peppy like a Who or grouchy like the Grinch you’re going to want to bring home The Grinch on Blu-ray, 4K, and DVD February 5th or Digital HD today! 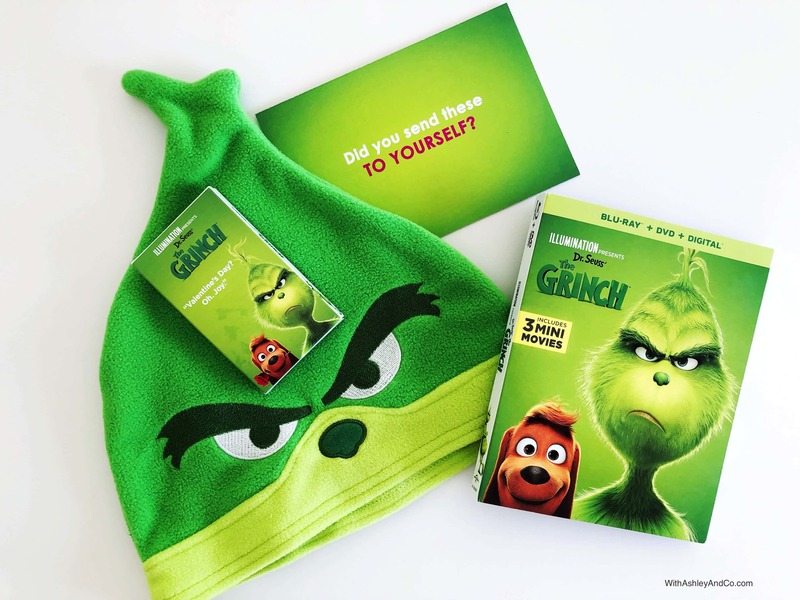 Keep reading to enter to win The Grinch Blu-ray Prize Pack. Trust me, those Valentine’s Day hearts are everything. I received an advanced copy for the purpose of this review. All opinions are my own. Who’s Who in Who-ville (interactive map) –There are so many interesting characters that call Who-ville home that it’s hard to keep track of them all. 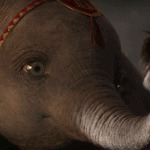 This “Who’s Who” pop-up book uses animation to create a virtual storybook that takes us from Who-ville to Mt. Crumpit. From Green to Screen– It takes a lot to bring grumpy green to your home screen. This inside look at the making of Illumination’s Seuss’s The Grinchfeatures interviews and behind-the-scenes moments with the cast, filmmakers and artists whose hearts have all grown three sizes bringing this classic tale to life. My Earliest GRINCH Memories – The cast and filmmakers of Seuss’s The Grinchreveal their earliest memories of the grumpy green character and the enduring appeal of this Christmas curmudgeon’s journey to redemption. “I Am The Grinch” Lyric Video– A stylized look at Tyler, The Creator’s original song created just for the film. Songs From His Little Heart – Take a deep dive into the toe tapping beats of Seuss’s The Grinch. From score to specialty songs, you’ll hear from the film’s A-list musicians on what it took to create the music behind the movie. Production Babies– A celebration of the babies born to the filmmakers during the production of Illumination’s Dr. Seuss’s The Grinch. All copies of The Grinch include 3 mini movies. Two feature everyone’s favorite Minions while the third is all about our favorite dog Max. Yellow is the New Black– Before they all make their big escape from prison in Despicable Me 3, a couple of lucky Minions get a taste of freedom as they break free with the help of one of their fellow human inmates. Dog Days of Winter– Max braves the harsh winter weather and an uncooperative Who to bring a sick Grinch his favorite hot tea. Santa’s Little Helpers– Fan favorites – the Minions – are back for another adventure! Having been accidently dropped off at the North Pole, our Minion pals make the most of the situation by trying to become elves. 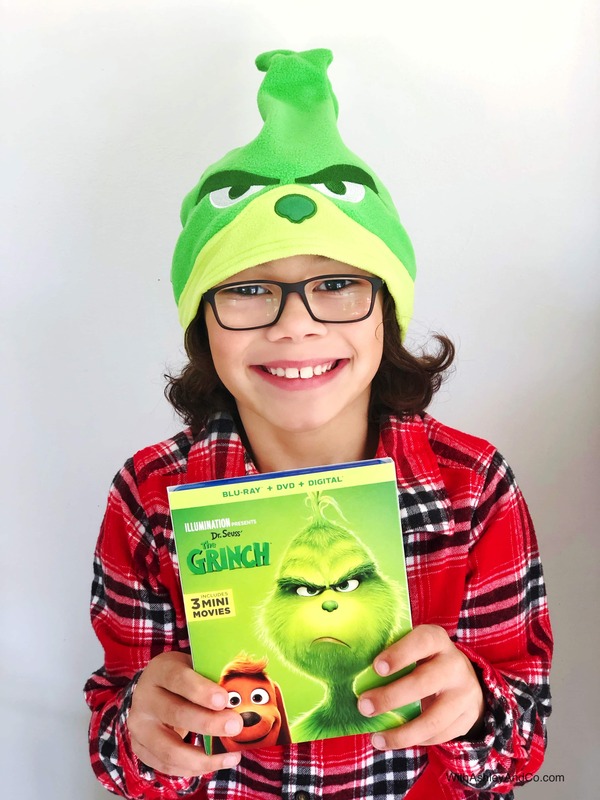 Enter The Grinch Blu-ray Prize Pack Giveaway! 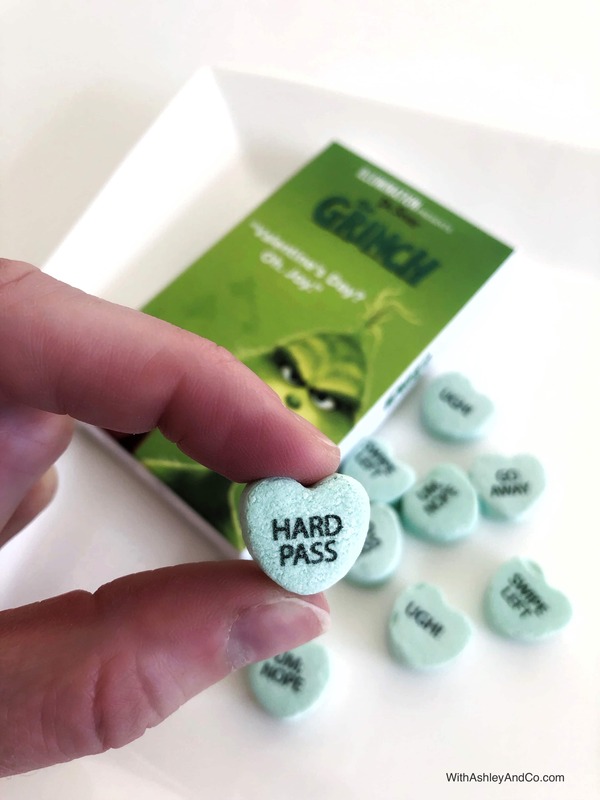 Grinch Valentine’s Day Candy Conversation Hearts- which I’m so in love with by the way! We’ve loved the original and the adult version of the Grinch. We’re looking forward to seeing this one. Great giveaway! What a great giveaway. I loved watching the Grinch back in the day, this looks like a fun version to check out. Because I can smell you. I love the Grinch! I haven’t convinced my son to like the Grinch at all. Maybe he will have a change of heart with this prize pack. I would say…Valentine…you make my heart grow! Here is some money, go buy yourself a gift or something. I don’t know where to start, because I have a Grinch-y heart, but I never want to be apart. despite my grumpy tone, I will never leave you alone! My heart grows bigger when I am with you! I would put “Will You Be Mine” on my Valentine. This looks like a fun movie. It would say Make this Grinch Smile! What does love have to do with Valentine’s Day?